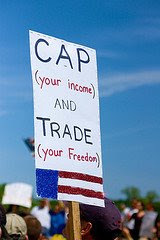 Learning the truth about "Cap and Trade"
Our Congress is now debating the merits and options of enacting "Cap and Trade" here in the United States. In case you're wondering, this system of carbon taxation has been in place in Europe for several years. It is the carbon tax that causes gasoline in Europe to be so expensive that few who live there can afford any kind of motor vehicle. Most get by there with bicycles and public transportation because that is the only option they can afford. If "Cap and Trade" is enacted here you can expect gasoline to go back to and beyond the four dollar mark immediately. The same will be true for your electric bills which will likely double especially if your electric company still powers its generating plants with coal. I read an article that estimates the average cost per family to be around $3,000.00 per year greater than what we are paying for energy now. The dirty secret of cap and trade is that it is regressive in nature. That means that it hurts the poorest among us the most. According to the Department of Energy the average American Family pays 3.5% for energy expenses as a part of disposable income, but among low income families the cost for energy is as much as 14%. (p. 263, Politically Incorrect guide to Global Warming, C. Horner) What will cap and trade do to them? Nothing but harm! And another secret you'll not hear about is the answer to the question, "Will cap and trade actually make a noticeable difference in the emission of greenhouse gasses?" For example, is it working in Europe where it has been in place for years? The answer is a big fat, No! There you have it! Cap and trade, a byproduct of the Kyoto Summit, will hurt the poor (and the rest of us as well), won't actually change anything about our climate proposals, and finally is yet another link in handing over our national sovereignty to global powers. You have every reason to educate yourself about cap and trade and to speak up about it to Congress while you still have a little room to wiggle. If you say nothing, and it passes, you will have lost your chance to protect our nation's ability to direct its economic future. Our Senate already rejected cap and trade the last time it was brought up by a vote of 95 to 0. Perhaps you can have an affect on the next vote if you speak up now. Just a thought. Here is a short video of my Grandkids having a picnic on our back patio. Taken March of '09. Yesterday, April 15th, Tax Day, was also the day for hundreds, and perhaps thousands of Tea Parties in small towns and large cities all over the U.S. I attended the early portion of the Tea Party in front of the Alamo in San Antonio. I arrived at around 3:15 p.m. There were some radio programs airing live near the Alamo (KSLR and WOAI). At 4 p.m. Glenn Beck and Rocker, Ted Nugent took the stage and aired the Glenn Beck program nationwide on Fox News. I would have liked it better if the stage had been high enough for the crowd to be able to see what was going on, and if the sound system had been working well enough for people to hear better. Still, I was impressed by the thousands (I would guess around ten thousand or more at that early hour), the entire Alamo Plaza was packed with a standing room only crowd. I was able to find a place under an oak tree about 60 or 70 yards from the stage. I will admit that the crowd was diverse: both young and old, men and women, ethnicities of all kinds, children and teens, vets, pets, folks in wheel chairs, folks with signs, banners, flags, tee shirts with logos, etc. The crowd around me was well behaved, polite, some were even friendly. I am taking time to describe the crowd standing around me because I think you need to hear something from an eye-witness. I have heard about the way these tea parties have been lambasted by the liberal media. Howard Kurts of the Washington Post reports, "At a Chicago demonstration, CNN's Susan Roesgen started arguing with a protester over why he referred to President Obama as a fascist. "I think you get the general tenor of this," she reported. "It's anti-government. Anti-CNN. This is highly promoted by the right-wing conservative network Fox." Though it is possible to find media nastiness concerning the tea parties, the greater issue is the way the liberal media simply ignored all the tea parties. Usually, anything involving more than one hundred thousand people in multiple locations will be covered on the networks, unless, of course, it is decided by the networks that this is a GOP or other right wing sponsored event. Speaking as an attender, I can declare that this was not sponsored by any political party, although it was attended by people from all persuasions with one thing in common, a desire for taxpayers to be listened to by someone in government. These feasts were arranged in groupings together so that the first three feasts were celebrated together for about 8 days in the spring (around March), and related to the barley harvest. The fourth feast happened almost two months later in the third month of the religious calendar(June), at the time of the wheat harvest. The third set of feasts happened in the fall (October) and were celebrated together as a group starting on the first day of Tisri which was the Jewish new year when trumpets were blown to announce preparation for the day of Atonement which would happen 10 days later. Then on the 15th-21st, they celebrated a week of celebration for the fall harvest of fruits and olive oil, and built booths on their houses or in their courtyards to live in for 7 days. This was a reminder of their 40 years of wandering in the wilderness and thanksgiving for the blessings of early and latter rains and the bounty of harvest. Jesus arrives in Jerusalem on the 10th of Nisan (Sunday)-the same day a passover lamb is set aside by a family to be killed 4 days later on the 14th. Jesus resurrects on the 18th of Nisan which is the feast of the waving of the sheaf of first-fruits. See Romans 8:28, I Cor. 15:20,23, Col. 1:18 for the New Testament significance of Jesus as the first-fruits of the resurrected ones. Following what we have already seen of the feasts, we may assume that the fall feasts are prophetic in nature and point to events surrounding the second coming of the Christ. The feast of trumpets is an announcement to the church to prepare for the coming of the Lord. Some even assume that these trumpets are the Rapture trumpets calling the church to come up and away before the time of tribulation. The Day of atonement has a double fulfillment, the first of which was accomplished by Christ on the Cross who fulfilled two roles as that of High Priest going inside the curtain to offer the atoning sacrifice, and as the sacrifice himself. Jesus represents the sacrifice to the Lord and also the sacrifice taken outside the camp as a scape-goat. Naturally, this did not happen in the fall of the year at Jesus' first coming, but there could be something meaningful happening at this time in Jesus' second coming. The day of atonement is also the day that the temple is cleaned and we saw Jesus cleansing the temple twice during his short ministry on earth in his first appearing. The final feast, of tabernacles, originally celebrated the completion of harvest, and was a time of great joy. Some see Jesus fulfilling this feast by returning to earth to tabernacle with men and begin his Millennial reign on earth. The point is that Jesus is tied in with all 7 feasts. When God originally commanded that these feasts be kept by the people of faith, He knew that Jesus would fulfill them all. And we see strong evidence of the same thing from the fact that the first four feasts have been fulfilled by Jesus in his first earthly coming. We look forward to the time when Jesus will fulfill the three fall festivals as well. We can echo the final words of Revelation, "Even so, Come Lord Jesus!"